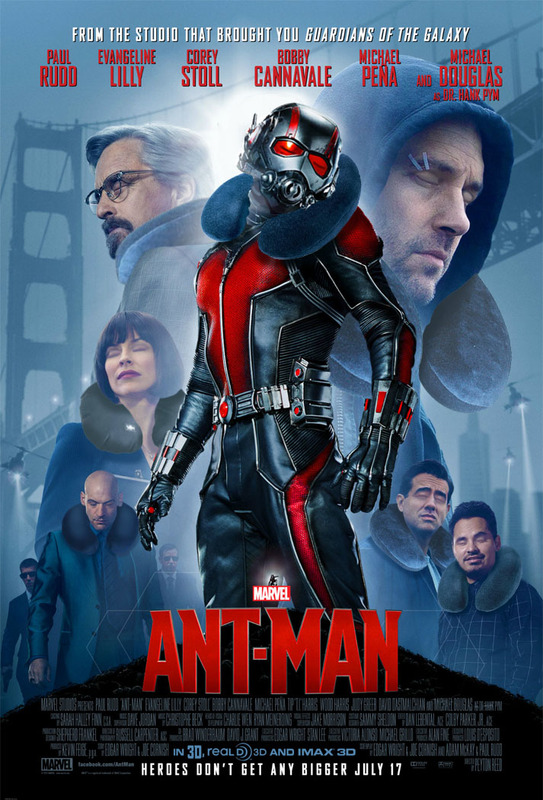 Sometimes, a movie arrives with very little fanfare or advance notice (in comparison to the supposed blockbusters of the day), and features a cast that makes the average viewer say to themselves, “Wow! What a cast! 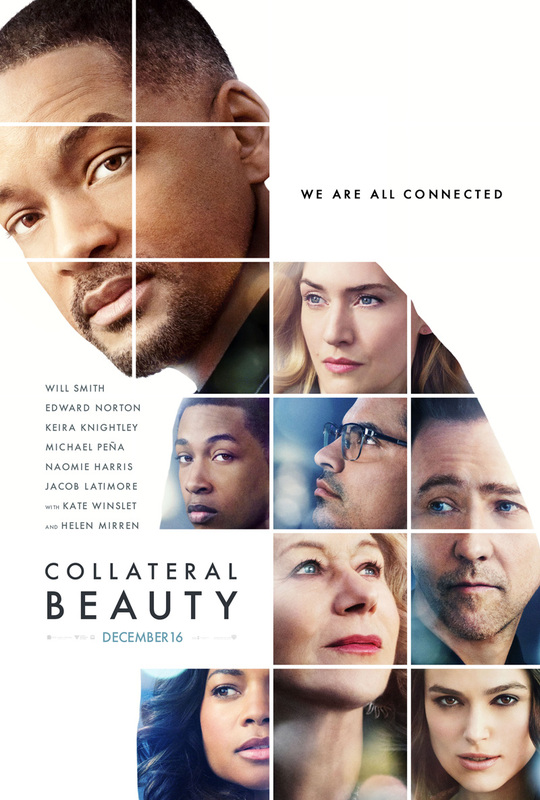 This movie’s got to be good!” Collateral Beauty is one of those movies, with its dream cast in service to a story that deals with unyielding grief, and which does so by employing magical realism as its main approach to telling the story. 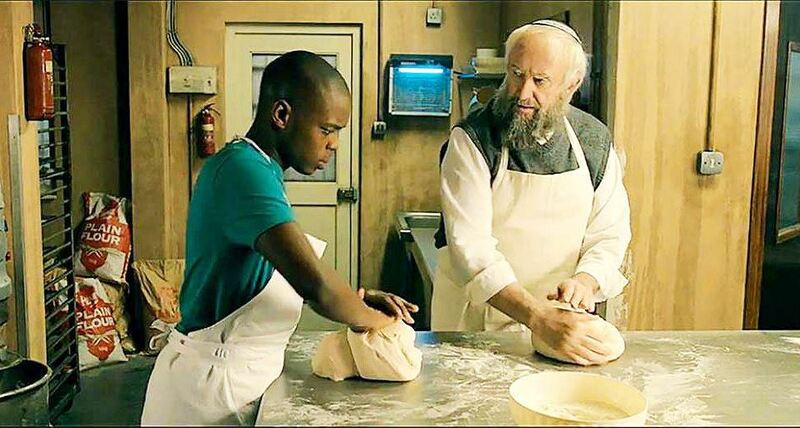 It’s meant to be an uplifting, emotionally dexterous movie – set at Xmas – that will leave viewers with a warm glow in their heart as they leave the cinema. Alas, Collateral Beauty – and despite the best efforts of its dream cast – isn’t actually that movie. What it is, is a tragedy wrapped up in a comedy wrapped up in a magical realist fantasy wrapped up in an awkwardly staged feelbad movie. It’s a movie that revels in the pain and suffering of a group of individuals who are the very definition of stock characters. Some effort has been made with Smith’s character, a marketing executive whose six year old daughter has recently died from brain cancer. Unable to let go of his grief (and not really wanting to), Howard still shows up for work but spends his time creating elaborate domino structures and neglecting the business he built up with best friend, Whit (Norton). With the company on the brink of losing their biggest contract thanks to Howard having “zoned out”, Whit needs to prove to a prospective buyer that Howard, who has the controlling interest, is sufficiently non compos mentis for the sale to go ahead without his involvement. But how to prove this? How, indeed. The answer arrives, like a gift from Heaven, in the form of budding actress Amy (Knightley). Through a process too unlikely to relate here, he hires Amy and her friends, Brigitte (Mirren) and Raffi (Latimore) to act as Love, Death and Time respectively, concepts that Howard has been writing to. Yes, Howard has been railing against Love, Death and Time for stealing his daughter away from him. Whit’s idea is for the trio to pop up at random and talk to Howard in various public places. These encounters will be filmed by a private investigator (Dowd), and the actors removed digitally before the footage is shown to the buyer, thus making Howard seem, at the very least, delusional, or at worst, completely bonkers. Now, the thing to remember here is that Whit, along with his colleagues, Claire (Winslet) and Simon (Peña), is Howard’s friend. Let’s let that sink in for a moment. His friend. Who with Claire and Simon decides to play charades with a man whose grief is all-consuming and all in order to save the company where they all work. They want to do this not, in the first place, to help Howard deal with his grief, but so that they can save their jobs. And this is meant to be a good idea, both in practice and as the basis for a movie. But not content with having them play mind games with their boss, the script also gives them their own problems to deal with. Whit has a young daughter who hates him because he had an affair that led to her parents’ divorce (as she puts it, he broke her heart). Claire has sacrificed her longing for a child in order to be successful at work. And Simon, who has fought off a serious illness twice before, is having to face up to the possibility that the third time might not be the charm. Throw in Naomie Harris’s grief counsellor, Madeleine (the only person Howard seems able to talk to about how he feels), who has also lost a daughter, and you have a group of people you’d cross the room to avoid at a feelgood seminar. They do glum with a capital G-L-U-M, and each time the script – by Allan Loeb, who has penned such classics as Here Comes the Boom (2012) and Just Go With It (2011) – indulges in their suffering it does so in a way that’s detrimental to the central storyline: Howard and his grief. There’s also the problem of the movie’s tone. 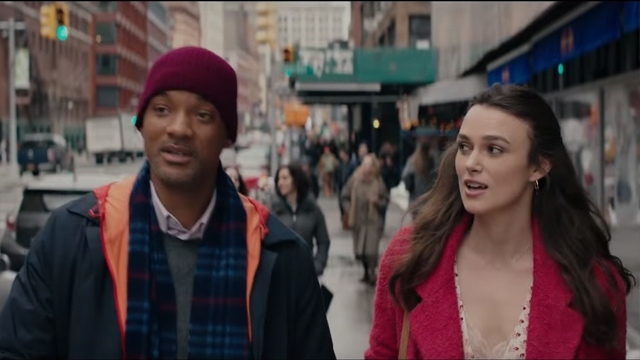 Collateral Beauty is about death, and the sorrow felt and experienced by the people left behind; it’s also about how grief can twist and contort feelings of pain and guilt into something much more violent and harmful. But Loeb’s script doesn’t want to address these issues head on, as quite rightly, this would make the movie a bit of a downer (and then some). So instead of making a straight-up drama about grief and loss, Frankel et al have made a middling comedy about grief and loss. While the themes in play remain serious, they’re all dusted with a light-hearted sheen that never feels right and never sounds right. The comedy elements distract from the drama of the piece, and in such an awkward, “oh no, they didn’t” way as to be confusing to the viewer. Is this a drama about grief, or a comedy about grief? But there’s no point in asking, as the movie doesn’t know any more than anyone else does. With the whole premise undermined from the very beginning, Collateral Beauty becomes an exercise in perpetual wincing. When actors of the calibre of Norton and Winslet can’t make the material work then it’s time to head home and call it a day. Scenes come and go that make no sense dramatically, but seem intended to provide a level playing field for all the cast so they have enough moments to add to their showreels. As the actors with no background in psychotherapy but given carte blanche to say anything they can think of, Mirren, Knightley and Latimore are acceptable, but rarely do anything that takes them out of their thespian comfort zones (there’s also a suspicion that Mirren is playing a version of herself that fans have come to expect rather than an actual character). 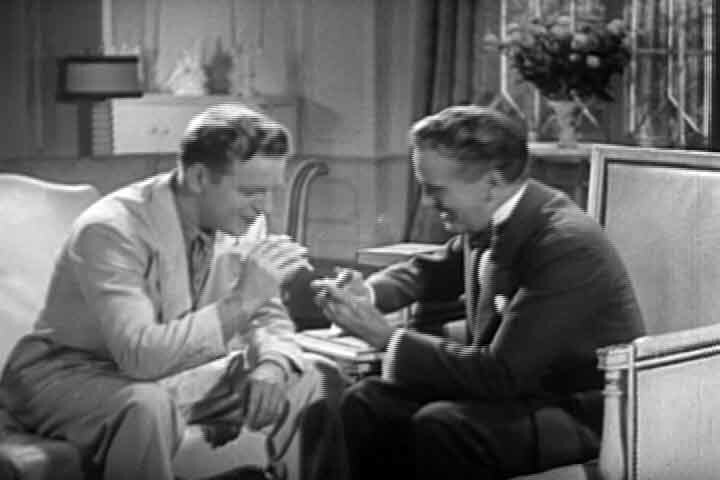 Smith at least tries to inject some much needed dramatic energy into his role, but until the very end, when Howard is required to undergo an about face because the script needs him to, he’s held back by the script’s decision to make him appear either vague or angry (or sometimes, vaguely angry). Norton and Winslet coast along for long stretches, and a restrained Harris is the voice of wisdom that Howard desperately needs to hear. That leaves Peña, whose performance elicits some real sympathy late on in the movie, and who proves once again that he’s a talented actor who needs to be given better opportunities and roles than this one. Overseeing it all is Frankel, whose previous movies include Marley & Me (2008) and Hope Springs (2012). You can understand why he got the job, but with the script unable to decide what approach it wants to take, Frankel is left stranded and unable to find an effective through-line with which to link everything together. It never feels as if he’s got a firm grasp on the narrative, or any of the underlying subtleties that Loeb’s script managed to sneak in when the writer wasn’t looking. In the end, he settles for a perfunctory directing style that keeps things moving along on an even keel but which doesn’t allow for anything out of the ordinary to happen. There’s no real dramatic ebb and flow here, and sadly, like so many other directors out there today, he’s not able to overcome something that is one of the movie’s biggest flaws. 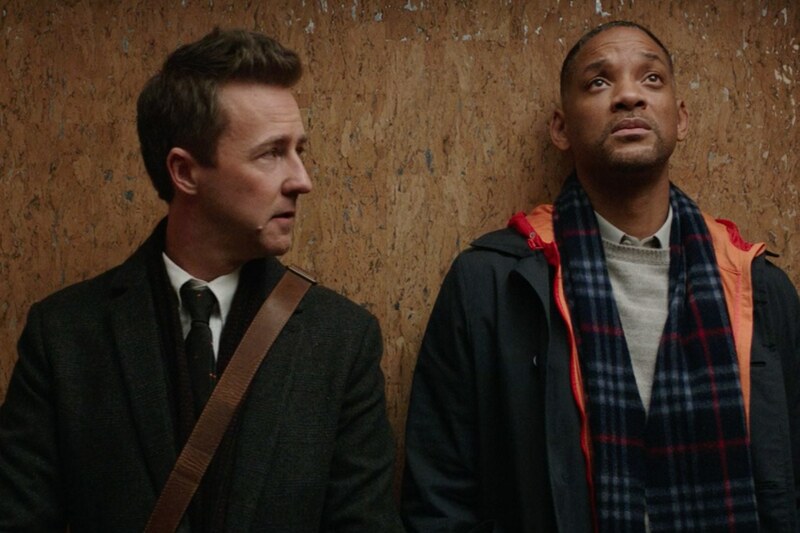 Rating: 4/10 – near enough to “meh” as to be on close, personal speaking terms, Collateral Beauty is bogged down by its schizophrenic script, and an over-developed propensity for ridiculousness; rarely has magical realism felt so false or poorly staged, and rarely has a movie about grief instilled the same feeling in its audience for having seen it in the first place. Do you like your cops as corrupt as the criminals they arrest/steal from? 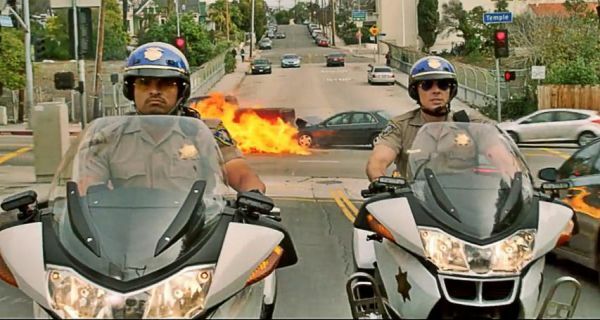 Do you like to see cops misuse their position and betray your trust in them at every turn? And do you like them to have so little regard for your (or anyone else’s) dignity or safety that they’d hit a mime with their car just to see if he yells in pain? Well, if you only answered yes to that last question, then War on Everyone is the movie for you. It’s a buddy cop movie where the cops in question, Detectives Bob Bolaño (Peña) and Terry Monroe (Skarsgård), will do everything they possibly can to screw over everyone they meet, be it their long-suffering boss, Lt. Stanton (Reiser), or one of their stoolpigeons, Reggie (Barrett), or just about anyone operating on the wrong side of the law (like them). When news reaches them that a big heist is being planned, naturally Bob and Terry want to know all about it so they can grab the money once the robbers have done all the hard work. But the man planning the heist is a shadowy figure they’ve not encountered before, and the details are equally shadowy; all they have are the men who’ll be involved but not the location or where the money is to be taken. With Reggie managing to get himself the getaway driver’s job, Bob and Terry think they’ve got it all worked out: follow Reggie, grab the cash at the earliest opportunity, and head off to somewhere foreign with no extradition arrangement with the US. But of course, nothing goes to plan, and Bob and Terry find themselves up against a British aristocrat called “Lord” James Mangan (James), the mastermind behind the heist, and someone who doesn’t take kindly to their efforts to hijack the robbery and take most of the money. 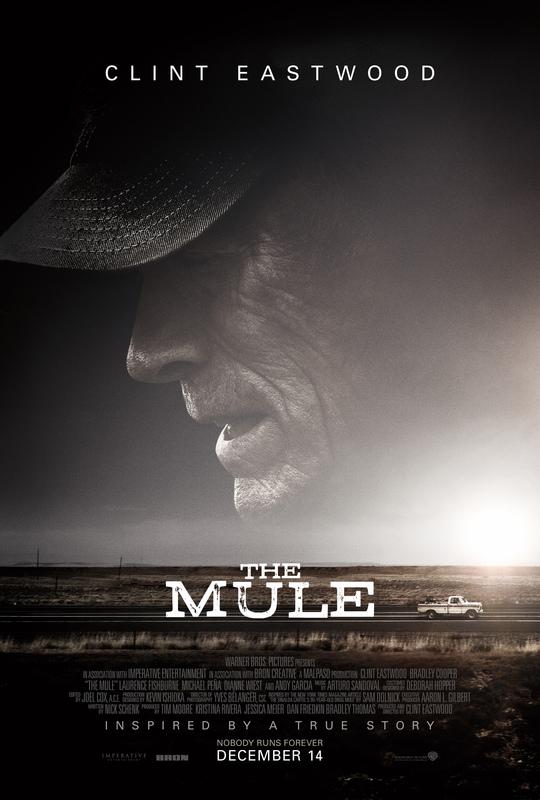 After the relatively sombre and restrained The Guard (2011) and Calvary (2014), writer/director John Michael McDonagh has decided to cut loose – and quite a bit – with this tale of two ultra-corrupt cops that’s set in New Mexico, is bolstered by the inclusion of Glen Campbell on the soundtrack, and which has a very gritty Seventies vibe to it. 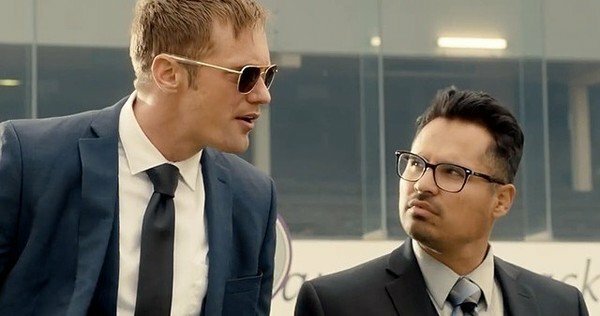 War on Everyone is also extremely funny in places, as you’d expect from McDonagh, and there are a plethora of laugh-out-loud moments to keep the audience happy and the script from seeming too formulaic. McDonagh is great at creating a world for his dysfunctional characters to inhabit, and the bright, airy spaces of New Mexico are used to good effect to create a surprisingly natural background for the absurdities that unfold in the foreground. The plot, such as it is, is acceptable without pushing any boundaries or bringing anything new to the table, and McDonagh is keen to highlight the fact that he knows this, and that the audience should just go along with it. It’s Bob and Terry who are the movie’s real focus, even though their relationship – built as ever on mutual trust and respect while everyone else (bar Bob’s family) is fair game – is one we’re meant to enjoy for its verbal jousting and the pair’s unspoken dependence on each other. Only when it seems that Bob has run out of luck do we see how much Terry depends on him as both a partner and a friend. 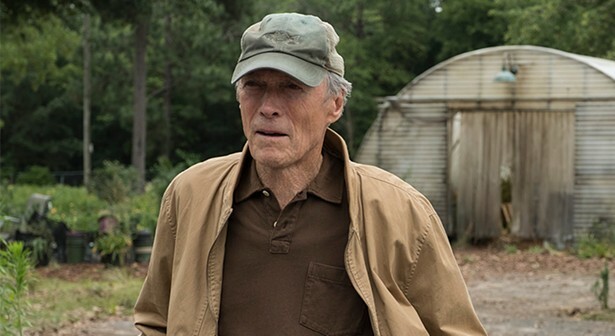 But in keeping with the characters’ macho exteriors, it’s a necessarily brief glance – and then back to the action. With McDonagh having established the bond that unites these two latter-day Robin Hoods (only difference: they don’t give to the poor), he adds subplots and secondary characters to flesh out the drama, but in the process and with the exception of Landry Jones’ twitchy portrayal of Mangan’s right hand man, Birdwell, never quite manages to make them as memorable as they need to be. Despite sending Mangan (literally) on an acid trip that’s designed more to show off some fancy camera moves and elaborate staging than to look into the mind of the character, the villain is essentially colourless and in the end, easily dealt with. Likewise, Terry’s love interest, Jackie (Thompson), who he places under his own personal protection and who he promptly falls in love with. Jackie’s a sweet enough character, and as a counterpoint to all the cynicism on display elsewhere she fits the bill, but McDonagh doesn’t develop her in any way, and she remains a frustrating caricature: the girl who needs to be rescued. As the two felons with badges, Peña and Skarsgård make a great team. Peña is the erudite, well-read partner who can quote from the Greek classics, and who realises that they can’t keep doing what they’re doing indefinitely (it doesn’t help that he looks a little like a Latino version of the British movie critic Mark Kermode). Skarsgård brings the muscle, folding in on himself a lot of the time and accentuating his forehead, as if he’s about to use it as a battering ram. He’s the more dangerous of the two, unpredictable, and Skarsgård projects just the right amount of bottled-up menace that the role requires. Together the two stars are a joy to watch, and McDonagh ensures that their camaraderie is entirely believable, even when he takes them out of their New Mexico comfort zone and sends them off to Iceland to track down an absconded Reggie. Making his first feature away from Ireland, McDonagh shows a confidence in his decision that isn’t supported by the way he handles the material, and on this occasion McDonagh the director doesn’t know quite what to do to combat the problems inherent in McDonagh the writer’s screenplay. But the movie is an enjoyable one for the most part, provided the viewer keeps their expectations to a minimum; then they might be pleasantly surprised by Bob and Terry’s antics, and also more invested in how things turn out. One area where the movie can’t be faulted is in its cinematography, courtesy of the very talented Bobby Bukowski, whose previous movies include Rosewater (2014) and The Iceman (2012). Thanks to his efforts, War on Everyone is often beautiful to look at, and he keeps the camera moving in ways that are often very inventive – and often without the viewer realising it. 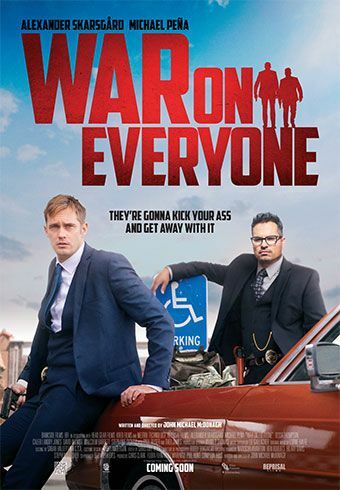 Rating: 7/10 – at times a raucous, freewheeling movie with plenty of buzz about it, War on Everyone can’t sustain it’s initial set up for very long, and McDonagh’s script loses its freshness around the halfway mark; good performances from Peña and Skarsgård help things immeasurably, but this has to go down as a missed opportunity from McDonagh, but not so bad that his next movie won’t be as highly anticipated as this one was. Watching contemporary horror movies is a pastime perfectly suited for the unabashed masochist, someone who will continuously, regularly put themselves through all kinds of cinematic detritus in the hope of finding that rare beast: the above average horror movie. It’s a calling, a passion if you like, and there are plenty of people who will settle down to watch ultra-low budget efforts such as Silverhide (2015) or franchise dregs like Hellraiser: Revelations (2011) in the certain knowledge that they’ll be wasting their time and afterwards, will be wondering why on earth they watched said travesty in the first place – what was I thinking? While such perseverance might be commended (or just marvelled at), the fact is that ultra-low budget horror movies are generally rubbish, and franchise entries are a dreadful infringement on our time and patience. But there’s a third kind of horror movie that endures today despite its commitment to shocking dialogue and nonsensical plotting, to vague characterisations and unconvincing acting. It’s the kind of horror movie that paints itself in respectability by having well-known actors in key roles, and by splashing a little more cash than usual. 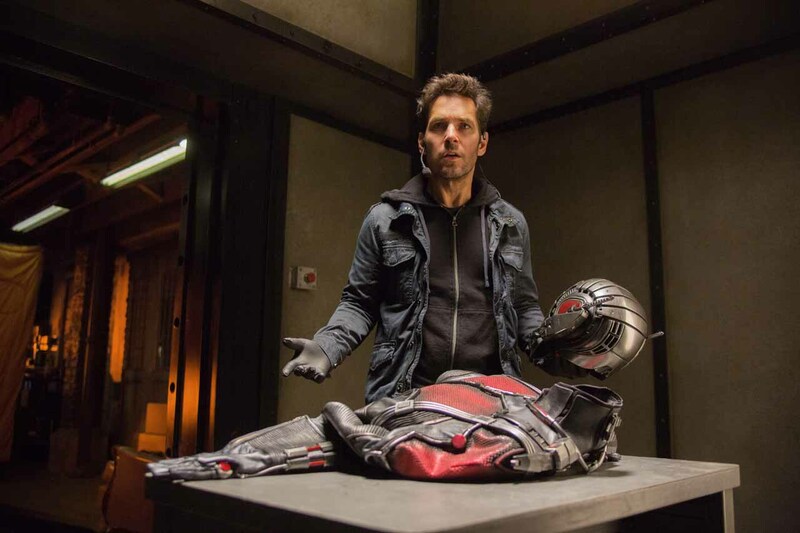 These movies also manage to find their way to our cinema screens – they actually open – and they work as stand alone movies that may or may not develop into franchises. But – and this is the most important point to be made about these movies – they’re still rubbish, they’re just made by people who really should know better. And after that cycnical preamble, we come to The Vatican Tapes, a movie so blind to its many irritating, mind-bending faults that it becomes a struggle to get through after the first few minutes, and where any efforts to improve on its tortured storyline and disastrous plotting have apparently been strangled at the preconception stage. It’s a movie that can’t decide whether it’s an exorcism tale, all about the rise of the Antichrist, or religious paranoia (though it tries to be all three at once). It’s the kind of movie experience that makes you want to do what one character does, and drive broken lightbulbs into your eyes so that you don’t have to watch any more. Going into a movie like this, there’s often the idea that because of the cast (who must know a good project when they see one, they’re all experienced actors, after all), the finished product will have an edge over the more bog-standard, predictable horror movies out there. And surely the producers wouldn’t have been able to attract such a cast with a dodgy script and a director with no clear idea of what he’s doing? Surely they wouldn’t have been able to do that, right? Wrong! 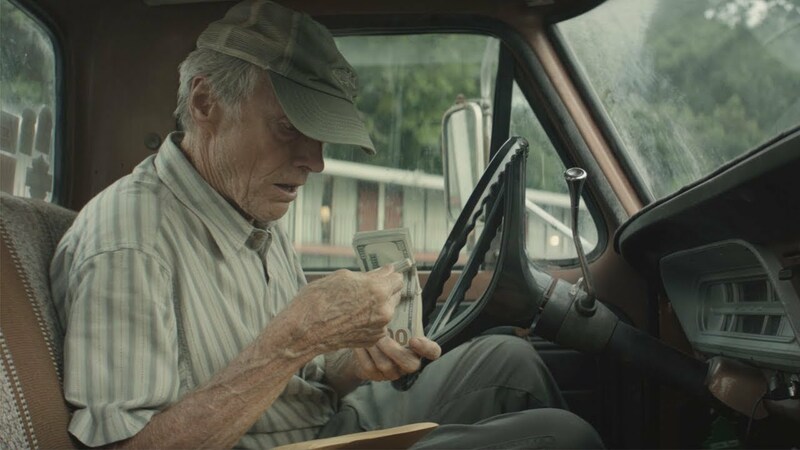 Most actors go where the money or the work is, and sometimes all they can do is take the money, make the movie, and then pray that no one ever sees it. Here we have Messrs Peña, Scott, Andersson and Hounsou all looking uncomfortable, embarrassed, and itching to get through their scenes as quickly as possible. Not one of them manages to attain any degree of credibility in their roles, and not one of them feels like they were cast in the right role. Of the four, Peña looks the most awkward, playing a priest, Father Lozano, who’s always in the wrong place at the right time, and who is the first to suspect that normally sweet-natured Angela (Dudley) is possessed by a demon. As the tortuous story continues, Peña hovers at the edge of group scenes with the air of a man hoping he could just take one more step to the left or right and then he’d be out of shot altogether. And Scott’s performance as a hard-nosed Army veteran and father of the possessed is staggeringly bad, with the scene where he describes his relationship with Angela’s mother rendered laughable thanks to the absurdity of the dialogue created by Michael C. Martin and Christopher Borelli, and Scott’s hamfisted attempt at sincerity. The story itself doesn’t make any sense, and varies in intention from scene to scene. Angela becomes possessed but is it through cutting her finger, or the subsequent attack by a crow on a bus, or while she stays in a coma for forty days (one of the more spurious connections with Jesus the movie makes on Angela’s behalf)? Ultimately it doesn’t matter because once the exorcism – conducted by Vatican honcho Cardinal Bruun (Andersson) and abetted by Lozano – gets under way, the focus switches from casting out a pesky demon to battling for Angela’s soul against an incarnation of the Antichrist who just so happens to have possessed Bruun when he was twelve. By now, the absurdity of the story will have become so apparent, all the hapless viewer can do is continue watching just to see if the movie can become even more absurd – which it manages with ease (the Antichrist as media darling, anyone?). It doesn’t help that the movie’s director, Mark Neveldine, has less than a firm grasp on the “dramatics” of the story, and instead concentrates on the visuals. However he doesn’t bring anything new to proceedings, leaving the movie looking like an homage to all the other recent horror movies that have traded on bleached out vistas and a jagged editing style overlaid with an effects heavy soundtrack that deadens the atmosphere and soon becomes annoying. And it remains resolutely scare-free. In a less conservative era, comedians would tell jokes that began “My wife’s so fat…” A modern day equivalent in this instance might begin with “This movie’s so bad…” and end with “it makes Nicolas Cage’s recent career choices look like worthy Oscar winners.” Or, “this movie’s so bad… it’s the only thing that can take my mind off of how fat my wife is.” It’s simply a terrible movie and unless you’re one of those unabashed masochists mentioned at the top of the review, should be avoided at all costs. 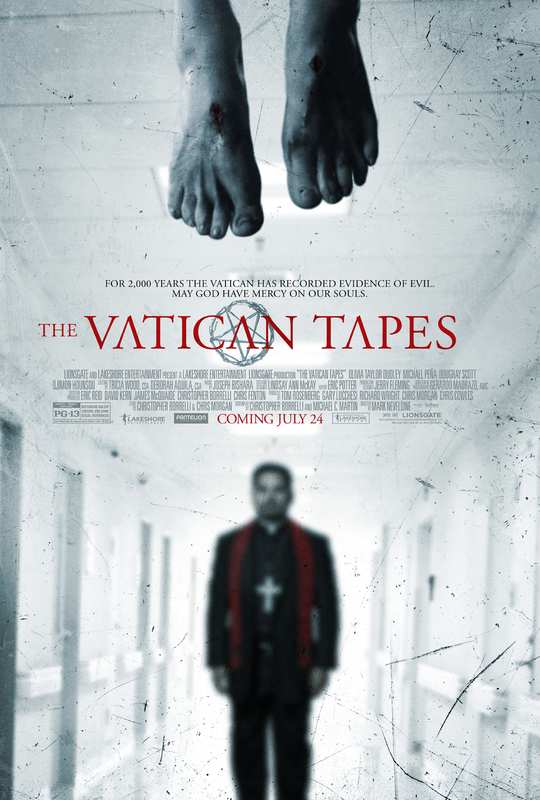 Rating: 2/10 – dire doesn’t even begin to describe just how ridiculously awful The Vatican Tapes is; it’s yet another horror movie made by people who have no clue what they’re doing and who just don’t seem to care if the audience likes it or not. April 1945, Germany. A battered, disabled tank lies amidst the carnage of a recently fought battle. Its men – Collier (Pitt), Swan (LaBeouf), Garcia (Peña), and Travis (Bernthal) – are battle-hardened and weary but they have an unshakeable bond. Under Collier’s tough, uncompromising leadership they’ve survived countless skirmishes, encounters and battles. Now, with the war nearing its end, they are all looking forward to peacetime. Travis gets their tank – named Fury – moving again and they head back to base. There, much to Collier’s disgust, they are assigned a new driver/gunner, Ellison (Lerman); Collier is disgusted because Ellison is too young, he’s only been in the Army for eight weeks and he knows nothing about tanks. Introduced to the rest of the crew, Ellison is treated with disdain and told to take a bucket of hot water and clean out the inside of the tank. When he does, he finds the partial remains of the previous driver/gunner. Meanwhile, Collier and three other tank commanders are given a mission to meet up with Baker Company and from there take over a small town. On the way to the rendezvous, Ellison’s inexperience causes the death of several men including the lieutenant (Samuel) who was leading them. Now led by Collier, the convoy carries on and they meet up with Baker Company and their commanding officer, Captain Waggoner (Isaacs). Before seizing the town, Waggoner needs the tanks to flush out a German unit that has several dozen US troops pinned down in a field. Fury and the other tanks get the job done, but Ellison’s inexperience nearly causes more casualties. When the fight is over, Collier tries to make Ellison kill a captured German soldier, putting a gun in his hand and telling him to “do his job”, which is to kill Nazis. Ellison refuses but Collier puts his hand over the young man’s hand and pulls the trigger. Ellison is horrified by it all but it proves to be a turning point, and when the nearby town is taken he is less nervous and is able to despatch the Germans without feeling too sick or nervous. With the town taken, Collier and Ellison investigate a building where they’ve seen a woman peering from a window. They find the woman, Irma (Marinca) and her niece Emma (Rittberg). While Collier washes up, Ellison takes Emma into the bedroom and clearly attracted to each other, they make love. Later, while the four are about to have a meal, the rest of Fury’s crew barge in and spoil things, before orders are received to report to Captain Waggoner. He tells Collier and the other tank commanders that there is a nearby crossroads that needs holding because of a large German troop movement that’s heading in that direction. But on their way there, the tanks find themselves under attack crossing a large field, and very soon the whole mission is in danger of failing. After the less than impressive Sabotage (2014), writer/director Ayer returns with a movie that paints a portrait of extreme heroism under one of the most difficult of environments, and with a keen eye for detail that grounds both the action and the characters. It’s a challenging piece of moviemaking and provides a reminder of just how awful tank warfare could be. 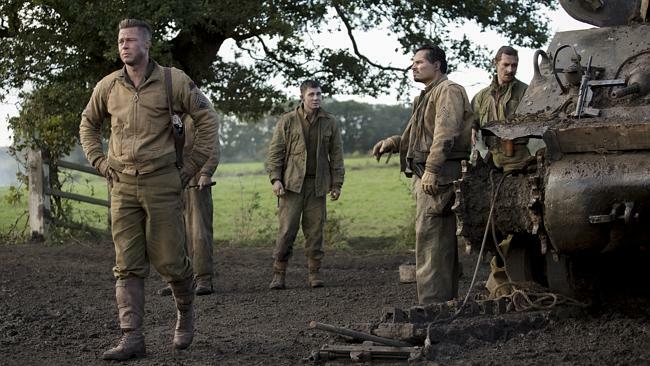 And yet, Fury is a curious mix of the heroic and the mundane. Ayer’s script paints each man as a distinct individual – Collier as noted above, Swan as religiously minded, Garcia as more carnally oriented, Travis as a bigoted animal, Ellison as a callow liability (at first) – but it doesn’t take the time to explore or delve into those characters any further than those broad brush strokes allow. Collier speaks fluent German but the reason for this is never revealed, leaving the audience wondering if it’s part of a back story that was excised from the final script, or if it’s just a case of Screenwriting Expediency 101, a way to keep the crew ahead of the Germans without them having to work too hard to get there. Ellison is the only character who gets a story arc, and while his initial shock is well presented, though predictable given his introduction, when he does take to killing Nazis, all of a sudden he’s enjoying it. The change in attitude is too quick, and is an example of Ayer’s script downplaying motivation in favour of the next big action sequence. The extended sequence in the apartment of Irma and Emma is another case in point where Ayer seems to be scratching the surface of an issue, highlighting the essential need, even in wartime, for people to hold on to their innate humanity. 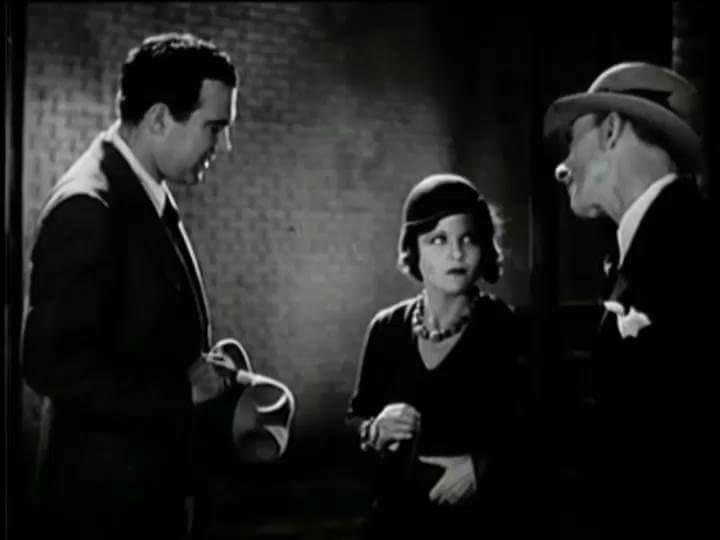 Collier and Ellison treat both women with the utmost respect but when the rest of the crew bundles in creating tension around the table and being hostile and objectionable, the tone shifts uncomfortably and Travis in particular is allowed to behave as if social manners were alien to him (he later apologises to Ellison but it’s not in the least convincing – if it were to happen in real life it would appear forced and contrived). The whole sequence becomes uneven and any message that Ayer was aiming for becomes lost in the telling. He then adds a layer of tragedy that speaks of the callous nature of war but which, for the viewer, will only come across as an unnecessary twist in the tale. With so many apparent flaws in the screenplay, and with its shifting tone proving hard to pin down, Fury presents a problem for the viewer in that it’s a movie that attempts to take a snapshot of one part of what happened in World War II and to make it resonate beyond that snapshot. This is almost a timepiece, a movie where the overall picture is lost in the mist and shadow that permeates the fields and roads that the tanks travel through. It’s not a bad approach as such, but without that wider focus, Fury limits itself to being solely about the men inside a tank, and with no real effort to expand on their characters, it becomes a snapshot with no context. Screenplay issues notwithstanding, the movie is on firmer ground with its action scenes, making the tank skirmishes urgent and vital, and deftly playing up the cramped conditions under which the crew operate, making a virtue of the economy of movement needed to load and fire the shells (try and count how many times we see Swan’s foot press down on the firing pedal). These scenes are impressively shot and edited together by Roman Vasyanov, and Jay Cassidy and Dody Dorn respectively, and offer a few heart-stopping moments along the way. But Ayer then settles for a final showdown between Fury and the advancing German troops that lifts action beats from every direct-to-video war movie you’ve ever seen, and which sacrifices credibility for the kind of careless heroics that undermines (and overturns) everything that’s gone before. Ayer is a talented individual, and he’s written some great scripts over the last fifteen years; he’s also making a name for himself as a director as well, but to date End of Watch (2012) remains his most fully realised project. Fury will definitely attract audiences initially but there’s a sense that, ironically, it won’t have “legs”. Which is a shame, as the movie could have been so much better had Ayer been more rigorous with his script. 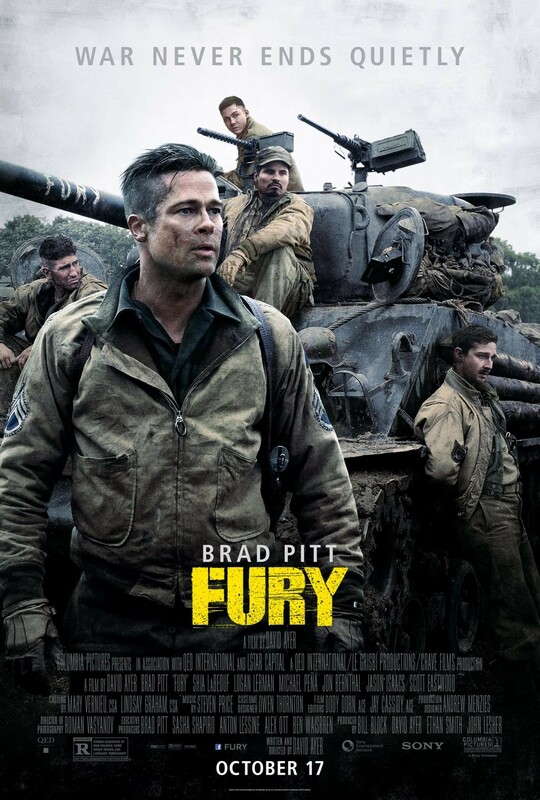 Rating: 7/10 – slightly better than average but with enough problems to make viewing the movie more disappointing than not, Fury bristles with energy during its action scenes but otherwise is sluggish; one to see on the big screen though, and with one’s expectations firmly kept in check.